Wooden fences were time consuming and expensive to erect and also required a lot of maintenance. The value of U.S. fencing stock in 1872 was just about equal to the value of all livestock in the country! The cost of maintaining those fences each year was more than all local, state and federal government tax revenues combined. Barbed wire changed that. The first commercially successful barbed wire was patented in 1874 by Joseph Farwell Glidden, a DeKalb, Illinois Farmer. 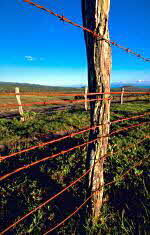 Barbed wire was cheap to produce and easy to put up, and kept roaming livestock out of farmer's crop fields. It was an immediate success and the beginning of the end of open range in the west. In 1876 commercial production was 1,500 tons and by 1900 annual barbed wire production had reached 200,000 tons. By 1910 wooden fences had almost disappeared.